As you would probably expect, there wasn’t just one Ant-Man helmet and suit. All together, costume designer Sammy Sheldon Differ and head suit designer Ivo Coveney, plus a team of artists, made: 13 Ant-Man suits, 17 helmets, 17 belts, 8 pairs of gloves, 15 backpacks, 6 pairs of shoes, 15 balaclavas and 14 necklaces (that go on the balaclava). 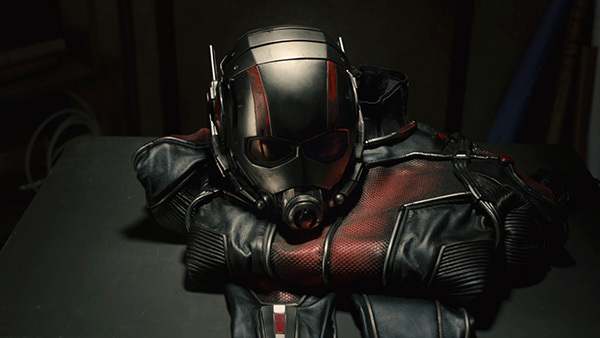 The Ant-Man suit is made of leather and is designed to resemble a vintage motorcycle suit. It was purposely given a worn and battle-scarred look because it was previously worn by Hank Pym when he wore the suit on his missions. The Ant-Man suit has over 159 remote-controlled LED lights, which can light up the whole suit, including the closes and belt. The circuitry and batteries for the lights are in a very small backpack. The Ant-Man helmet has 54 different pieces and 10 LED lights. If you include all of the nuts and bolts and the helmet lining, there is over 60 individual pieces. 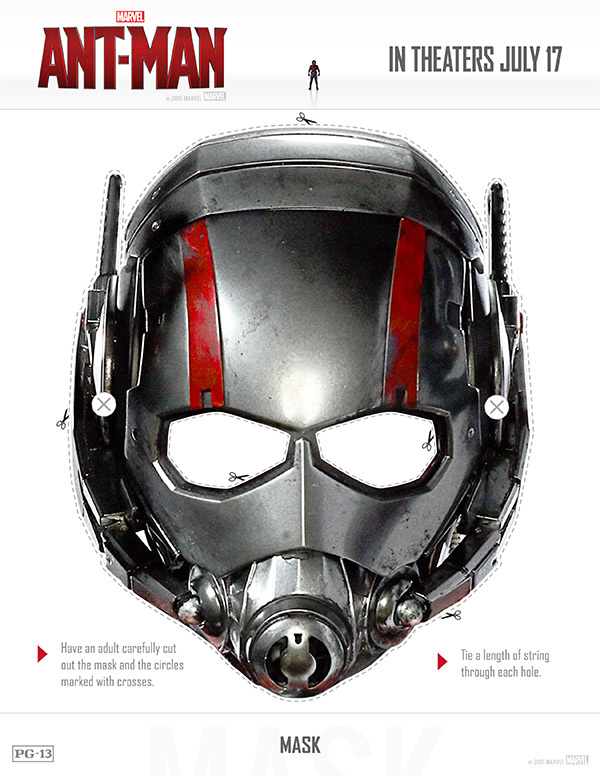 Want a FREE printable Ant Man Mask? We have something cool for all the kids who love Ant-Man: we’re giving away an FREE Printable Ant Man Mask! Just click the link or photo below to print the mask (don’t print the image below — make sure you click it first and print the image that opens for the best quality). After printing, cut along the dotted lines and tie string onto the round areas shown with an “X”. 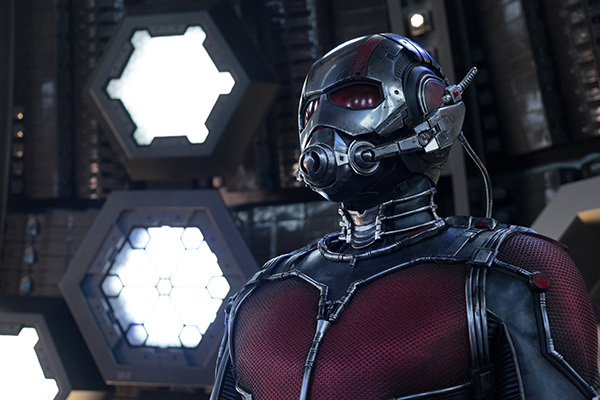 If you haven’t seen Ant-Man yet, we HIGHLY recommend that you take your family to see it! We loved it! 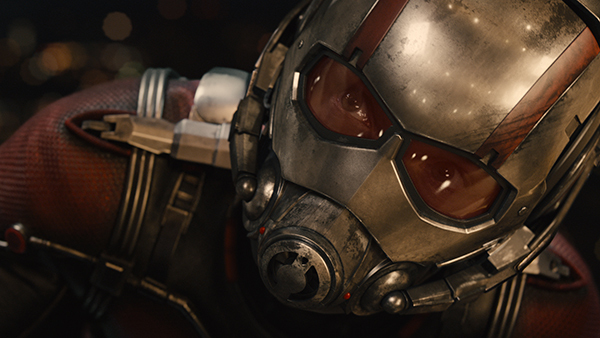 ANT-MAN will be available on Blu-ray and DVD on December 8th!